There’s much to celebrate about Siesta Key, especially the many awards for its half-mile long public beach that adjoins another two and one-half miles of pristine, quartz sand delivered millions of years ago from the ancient, Himalaya-sized Appalachian Mountains. 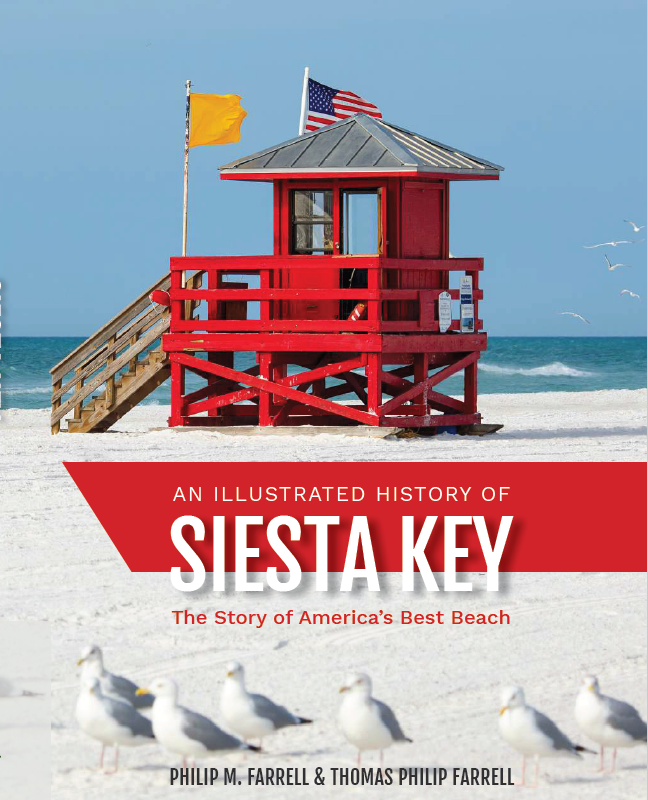 Although now arguably overdeveloped, and currently overwhelmed with traffic, it was once one of Sarasota County’s “hidden treasures,” to quote historian Jeff LaHurd, until Dr. Beach and TripAdvisor proclaimed Siesta/Crescent Beach as “#1 in the USA.” Siesta Key has a rich and colorful history that can be divided into ten distinct periods listed below. To celebrate the unique distinctions of Siesta Key, my grandson, Tom, and I with the superb computer graphics assistance of my granddaughter, Julia Farrell Patton, began an intensive year of writing a book entitled An Illustrated History of Siesta Key: The Story of America’s Best Beach during May 2017. That month, Tom graduated from the University of Wisconsin, and we completed our research and interviews. It is being published this month by Pineapple Press, another “hidden treasure” of Sarasota, as a 210 page paperback organized as 20 chapters and available for $21.95 (Google: “Farrell and Siesta Key book”). The book provides reviews and analyses that integrate history and anthropology (Tom’s two majors) with archaeology, coastal geology, engineering, and geography. Tom, Julia, and I, in association with the outstanding Executive Editor of Pineapple Press, June Cussen, selected 153 illustrations for the book, including sixteen in an attractive color section, to ensure easy beach reading. Frankly, there were at least 100 more photographs or vintage postcards that we could have featured, thanks to Larry Kelleher at the Sarasota County Historical resources Center. Tom and I date the advent of Siesta Key tourism to May 3, 1917 when the original north bridge opened to automobile traffic after Sarasota Mayor Harry Higel secured funds for this ambitious and precocious construction project. Ten years earlier, the important “drumstick” head of this three-thousand year-old barrier island had been unsuccessfully platted by the Siesta Land Company— ultimately leading Harry Higel to adopt the name “Siesta Key” for his “wondrous place to rest,” as well as develop. The first hotel, a glorified boarding house with fabulous clam chowder, the Roberts Inn, thus became the Siesta Hotel and soon was in competition with a more luxurious resort, the Bay Island Hotel. Next, the ill-fated Higelhurst Hotel thrived along Big Pass but only for a few years before burning down— 33 days before the bridge opening celebration. More tragedy followed for Mayor Higel as he was bludgeoned to death on January 6, 1921 at a time that the City of Sarasota was unprepared for good medical care and police work. During our many months of research and numerous interviews, Tom and I discovered several unrecognized or forgotten aspects. Some of our favorites include learning about the indirect but profound “Influence of the Spanish” (Chapter 4); the obscure cemetery where the pioneering family of Captain Lewis and Ocean Roberts are buried in unmarked graves (Chapter 5); new, incriminating information on the probable perpetrator of the Harry Higel murder (Chapter 7); the mysteries of the Sanderling Club (Chapter 9); the crucial role of the first Spring Break visitors— the still prominent Amish and Mennonite tourists (Chapter 11); reasons for the multicolored lifeguard stations and public beach expansion with acquired Gregg properties (Chapter 12); the series of incredible maneuvers that saved the Summerhouse from demolition (Chapter 14); the game-changer for Siesta Key Village and how Captain Curt’s won the 2007 Great Chowder Cook-Off (Chapter 15); and the true story of the Midnight Pass closure (Chapter 16). We also included controversial issues such as the evils of USACE dredging projects and the menace of red tide. These topics are all discussed fully in the perspective of how they shaped Siesta Key’s evolving cultures. As stated Chapter 1, “In our research, it became obvious that understanding and explaining the development of Siesta Key required not only an appreciation of Sarasota County history over at least the past two centuries but also learning how to analyze it in a broader perspective, especially in the context of Florida’s evolution as a tourist destination.” Thus, the book provides an abundance of context for readers along with references for more in-depth reading.